I am back from a quick trip to Ohio State University, Columbus, Ohio to see Dr. Byrd for my ibrutinib trial with good news. My clinical exam was normal - no enlarged nodes or liver (my spleen has been long gone, removed more that 8 years ago in an unsuccessful attempt to raise my low platelets). The rest of physical exam was normal. But what about the lab you ask- many of us with CLL may look good, but it is often our labs that are wonky. Not mine. No anemia and basically normal platelet and normal neutrophil counts. The total lymphocyte count that includes our cancerous B cells was even a bit lower than normal. So if my total lymphs are low, then my cancerous CLL cells must also be low. And that is very good news. I won't know the actual number of lymphocytes that are part of my bad monoclonal clone until the fancy flow cytometry come back in a few weeks. That test tells what percent of my lymphocytes are cancerous. And then even later, I will learn the results of the important research test that looks deeply at my cells for the common mutations that could make my cells resistant to ibrutinib. A negative test (no significant mutations) bodes well for the ibrutinib to continue to work its magic, a positive finding suggest a relapse may be in the offing. This is important because in high risk patients such as yours truly with an unstable cell type (17p deletion and complex karyotype) there is a small but real annual rate of relapse on ibrutinib. This test looks into the future and projects who at risk. That's why I am always pushing for a second step beyond monotherapy with a signal blocker (ibrutinib and idelalisib). We need a one-two knock out punch. My blood chemistries are mostly good too, though one very old school, inexpensive marker is abnormal. My LDH (Lactic DeHydrogenase) or LD has been slowly climbing. This is a very nonspecific test as LDH is a ubiquitous enzyme found in most cells (and in bacteria too) that can be a marker of all kinds of cell destruction (heart, blood, lung, liver and even brain are common sources) or certain serious infections or certain types of tumor proliferation or nothing. My LDH was been slowly trending up for a year and is now slightly above normal. Dr. Byrd is not worried as the much more specific markers of disease are all reassuring. When we have CLL, there is always some fly in the ointment, some minor distraction, some nagging uncertainty. Life rolls on and life is good. With CLL, we are never dealt royal flush, never have a sure thing, but when we have a darn good hand we need to celebrate and enjoy. So I am off to ASH 2015, the largest and most important hematology meeting of the year, next week in Orlando. I am fighting a cold and tenosynovitis of my right thumb (think pain with using your thumb), but I am not going to let such trivialities slow me down, though I am going to take a short nap as soon as this post is online. Sleep- sweet nature's balm. ASH will be crazy for sure because as it will be nonstop interviews and meeting and abstracts and press conferences. Someday soon I also hope go as a researcher or as a speaker as I did at iwCLL where I spoke on how to improve access to expensive drugs in front of 500 plus doctors. That will take more work and effort, but I have plans. I also am getting used to the tables being turned and having the microphone in my face as I am now the occasional interviewee and not the interviewer. And I go as friend. After so many years and conferences, many of the top CLL researchers have become friends, members of our scientific advisory board and active in our nonprofit CLL Society. There is not too big number of patients and advocates in attendance, but I will connect with some of them there and at a related meeting for nonprofits in the blood cancer world that we will attend. Much to share. All good. Finally, if you live in the LA area, please join us at City of Hope on Dec. 15 for a patient education forum and the possible launch of a new support group. Details are here. I had MR imaging of my abdomen and pelvis earlier this week at St. Jude. The results were compared to my CT scans done on June 30, 2014 at Ohio State, about 16 months ago. I am now on my 42nd month on ibrutinib as part of the OSU clinical trial. The abdomen showed no adenopathy. No abnormal nodes. None. No big nodes! My pelvis did show one plump node in the left external iliac area (drains the lymph from the left side of GU tract) that was borderline enlarged and probably 2 millimeters bigger than it was before. Different techniques, different doctors, different times. I don't think the 2 mm. means anything and either does Dr. Byrd so I refuse to worry. I switched to the less precise technique of MR to avoid the potential cancer causing risks of ionizing radiation of the many CT scans that are part and parcel of clinical trials. When relapses happen with ibrutinib, they often start in the nodes. And that clearly is not happening in my case. And that is great news. It is not a perfect test, but I had neither one at detectable levels. A week later I am back at OSU for my 3 month check-up. Flying to Ohio in the late fall and all winter is not predictable, but what I can predict is good care and what I can anticipate is more good good news as I am heading towards 4 years on ibrutinib. UPDATE: My CBC at the infusion center Nov. 12, 2015 was basically normal. Hemoglobin was really normal at 14.5 so no anemia, platelets were very slightly above normal at 458,000 due to my splenectomy, ALC was at the low end of normal at 1.0 and that makes me most happy and my ANC was a healthy 8.1. 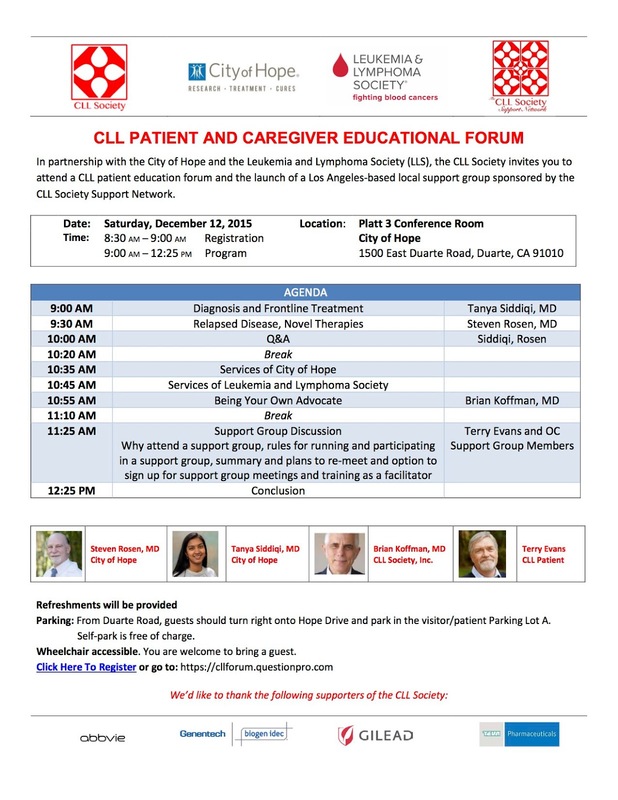 Hope to see you at our after ASH educational bash at City of Hope on Dec 12. Click here for the details.